June 1944. One man's decision is about to change the course of history. Scottish meteorologist, Group Captain James Stagg, the son of a Dalkeith plumber, must advise General Eisenhower on when to give the order to send thousands of waiting troops across the Channel in Operation Overlord. In what became the most volatile period in the British Isles for over 100 years, the future of Britain, Europe and our relationship with the United States, rested on the shoulders of one reluctant Scotsman. Pressure is the extraordinary and little known story of a Scot who changed the course of war, and our lives, forever. David Haig is a four time nominee and Olivier Award winning actor best known for his roles in the film Four Weddings and a Funeral , TV series The Thin Blue Line and stage production The Madness of King George III (National Theatre). He is also an award winning playwright. He wrote, and starred alongside Daniel Radcliffe in My Boy Jack - which was made into a TV drama for Granada in 2007. Appropriate ID will be required to verify age or status. Spend a relaxed but informative morning with local historian and theatre expert Owen Dudley Edwards as he discusses Pressure. "A thunderous piece of theatre." "Haig's script quickly sets up the story and plunges into a fast paced, confident stride, pausing only briefly before an almighty storm." "David Haig’s new play creates a storm at the Lyceum!...Don’t miss it – no pressure!" 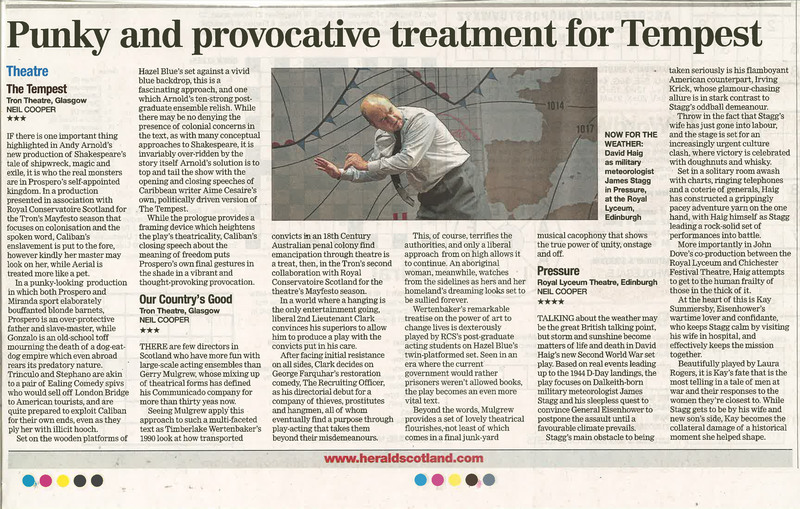 "...a grippingly pacey adventure yarn..."
"...you won’t see anything to surpass Pressure in Scottish theatre this year..."
"A gripping play about a man under almost intolerable stress." "A performance of rare integrity and emotional depth"
"Genuine edge of the seat drama with real heart and soul." "The intimacy generated by the cast draws the audience in to this little world that has such a great influence on the wider one, and I can safely say I have never been so eager for it to rain in the UK."